As I said before, summer was dedicated to the family (children and grand-children) who visited us. 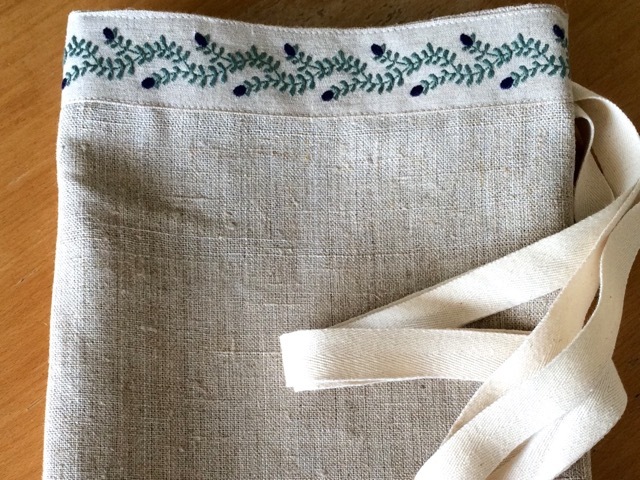 Although I spent most of the days in the kitchen, I had a little time to sew for my daughter an apron with an ancient piece of linen. 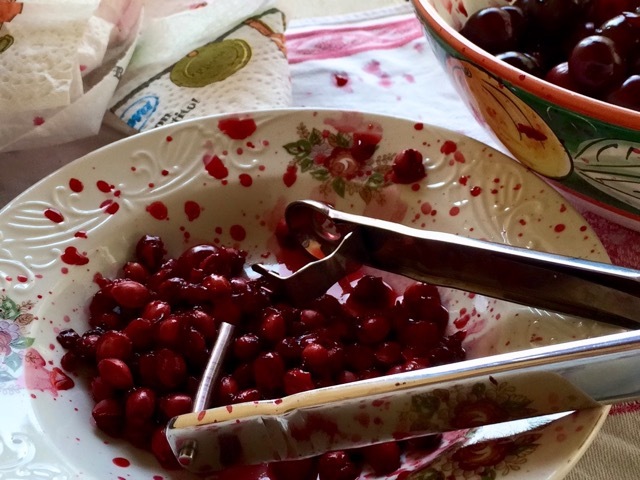 I pitted kilos of cherries to prepare jars for the winter. We collected the almonds from our tree and peeled them. I did as well tomato sauce jars, but they were eaten before I even thought of taking pictures! I may prepare some more jars, as we still find very good tomatoes at the market. That's a beautiful apron. such an elegant and simple design. Nothing better than home grown produce. Very pretty apron. Sounds like a fun and delicious summer. 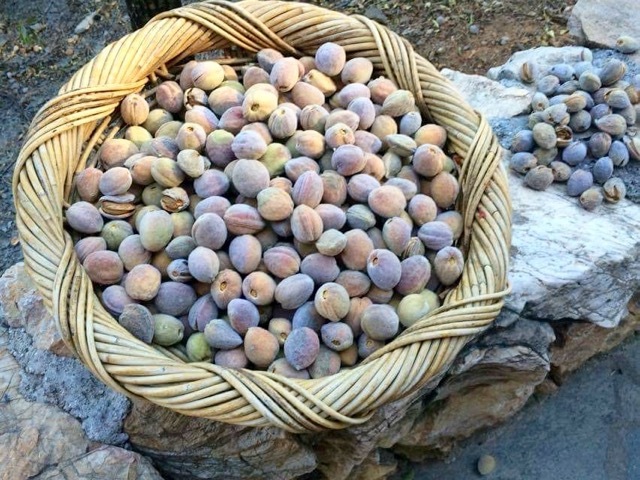 I actually didn't know that almonds look like this fresh off the tree! Sounds like a marvelous summer! A mouth-watering post this morning! A lovely vintage linen apron, this would be a joy to wear. 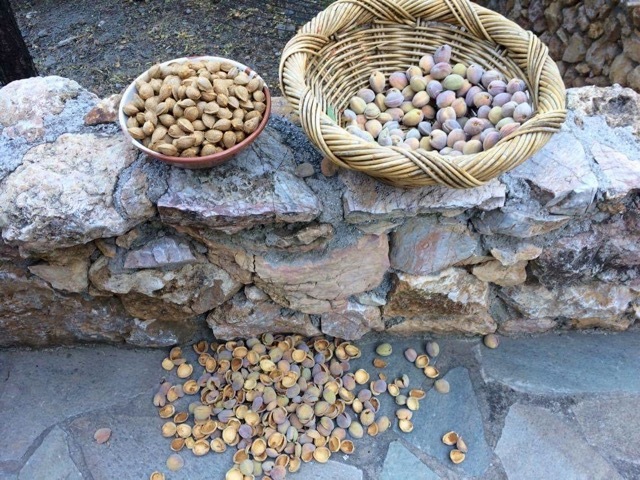 The colour in your two photos of the almonds sitting in the basket on that absolutely glorious stone all has taken me back to 1962 when we had two days in Athens en route to NZ. Vivid in my memory is the light and the the colour of the stones underfoot and the wonderful Parthenon, as it was sunset everything in the Acropolis glowed! Beautiful. What a beautiful harvest! And the apron looks too pretty to use. What gorgeous embroidery trim.